I really wish that phone manufacturers would make up their minds and choose just one fast charging technology. Some phones use Qualcomm Quick charge, others use a 5V 3A power supply via Type-C (I won't even get started on those who do something else completely different). It's annoying that each group of devices requires a different charger to charge at its peak potential. That is, unless you have one charger that can do both. 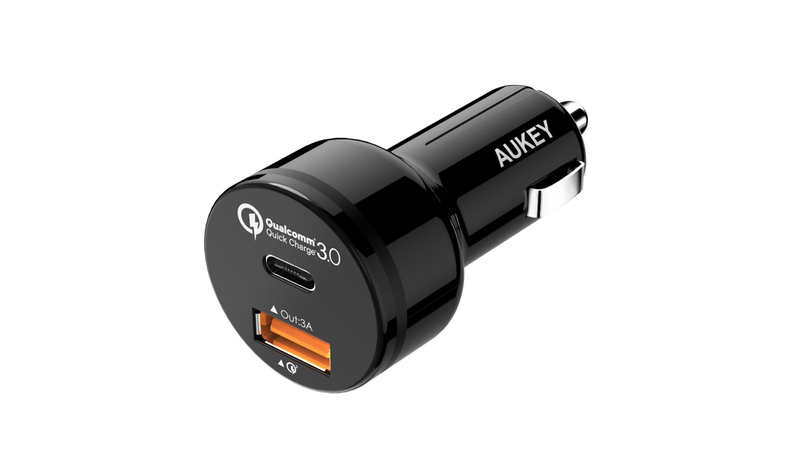 That's precisely what this AUKEY car charger has, with one port for each charging technology. It's also on sale for more than 50 percent off today when you apply a coupon code. Frequent device switchers or couples and families sporting phones using different charging technologies should be all over this deal. Head over to Amazon to pick one up for yourself if it strikes your fancy. Make sure you apply the coupon code ZW6AYBPF at checkout to chop the price in half like a deal ninja with a price slicing katana. For those of you on team QC, I've got a bonus deal for you. AUKEY shared another code with me for a dual-port QC 3.0 wall charger. It's normally 20 bucks, but the price falls to $10.20 with coupon code 4WIZSDV4. If you are new around here and aren't familiar with AUKEY, then you'll be happy to know it backs its products with a 24 month warranty, which is likely longer than the warranty you have on your phone. What won't last 24 months is this deal, it expires tomorrow. Now's the time to buy if you want one.